Today we went to the K-wave sports center in Kesennuma, which is now a buzzing beehive of an evacuation center on the top of a beautiful hill. Above is one of the courts covered in people and their cots and belongings (dimly lit to conserve electricity). The girl in the glasses in the above photo was one of the first people who greeted us as we set up. We're not sure if it was our "Disaster volunteer" arm bands, or Gene's handsome face, but she was so friendly and kept coming back to share her snacks with us. 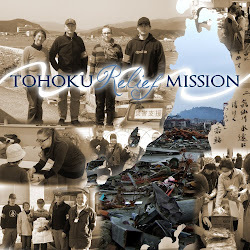 We were able to drop off 12 boxes of toilet paper, and blankets that were donated to Yuki and Isamu (http://helpeastjapan.wordpress.com) for the disaster victims. We were minus our 2 professional clown companions, so we braved the balloon-making on our own!!! The evacuees were extremely friendly, and seemed to enjoy our songs. We stayed for a long time and talked to the ones who hung around after our show. Many of the people told us to 「がんばってください!」 I started rushing to say it first. Gene was the hit with the kids. He couldn't refuse them when they kept asking for more and more balloons. We had an extremely animated audience, who were so much fun to perform for. They sang along to 「涙そうそう」 and cried when we sang 「世界を変えよ」. Keep it up! GBYguys! We're praying for you and following in your footsteps!